Leeds-based Arrow Cars, the official private hire partner of Leeds Bradford, Manchester, Bristol and East Midlands airports, has expanded into its fifth region after being awarded a five-year contract with Birmingham Airport to deliver private hire services from January 2019. With turnover this year forecasted to hit £20million, Arrow Cars is the second largest taxi/private hire company in the UK, excluding Uber. The expansion into Birmingham will see 14 new jobs available for full-time administration staff along with more than 100 additional drivers. This brand-new, premium offering is a first for Birmingham Airport and will see the experienced operator manage terminal front-based bookings for walk-up journeys on-site. It follows Arrow’s successful relationships with four of the UK’s major airports, having worked exclusively with them for more than ten years. The partnership will also provide customers with the opportunity to pre-book journeys online, via both the Arrow Cars and Birmingham Airport official websites, plus a downloadable app available on any smart device. Arrow Cars was founded in 2004 by chairman of the business, David Richmond, when he purchased a group of small private hire companies – one of which was Arrow Cars. Since 2004, the business has grown from strength to strength, employing more than 120 full-time employees, excluding the 750+ drivers based across the country. The private hire service delivers passengers with a unique, cost effective and seamless airport transfer service with dedicated pick-up and drop-off points directly outside terminal buildings, 365 days a year. 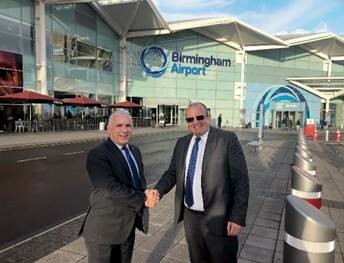 Richard Gill, acting commercial director from Birmingham Airport, said: “We are pleased to be introducing an official private hire service at Birmingham Airport. Providing our passengers with ease of travel is important – the new private hire service will enable passengers to pre-book and pay in advance for their onward and return journeys to and from the airport.